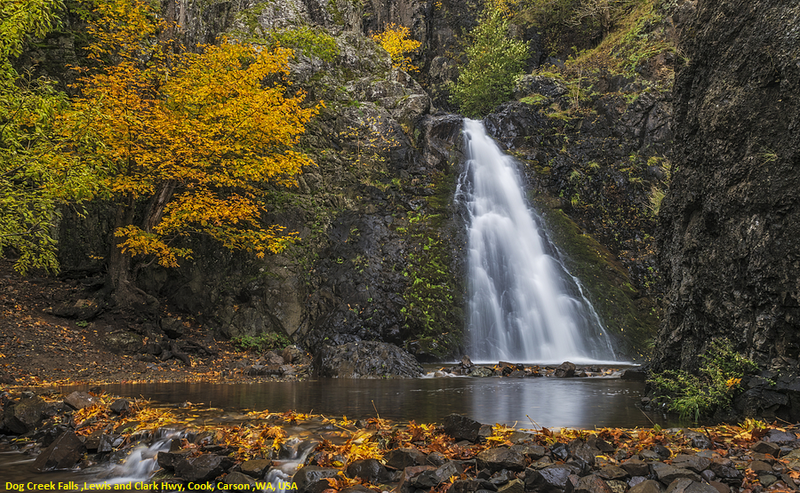 Despite its comparatively modest size, Dog Creek Falls is one of the most visible waterfalls along the Washington side of the Columbia River Gorge. Dog Creek has cut itself a fairly impressive canyon between Dog Mountain and Cook Hill.But because of the sheer basalt walls, the 30 foot fall visible from Highway 14 is the only known drop. Being only 30 feet tall, it may come as a bit of a surprise to some to find that the falls can be seen quite clearly from the Mount Defiance Trail and Highway 84 on the opposite side of the Columbia River.